RS-MR8515 is a 40-pin DIP type small CPU board, which has an ISP(In-System Programming) port, reset button, 8 MHz X-tal, and 32 I/O port pins. 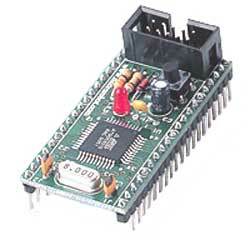 It uses an AT90S8515 (Atmel AVR series) CPU chip as a microcontroller. The AT90S8515 has 8K bytes In-System Programmable Flash memory, 512 bytes SRAM, 512 bytes EEPROM and many other peripherals. The user can download a program to the board without a ROM Writer using the ISP function. A free C-compiler (AVR GCC ) is provided. PORT: PA0~7, PB0~7, PC0~7, PD0~7, ICP, ALE, OC1B, /RESET, VCC, GND. 10 Pin ISP Port . 8 Kbyte ISP flash, 512 bytes SRAM, 512 bytes EEPROM, two Timers, UART, dual PWMs, WDT with Internal RC Oscillator and more.